BitLocker is an easy to use proprietary encryption program by Windows which can encrypt an entire drive and protect it from unauthorized access. Windows PC’s running Windows 7 operating system or above supports the BitLocker program. (Business, Enterprise and Education editions). 1. Go to the Policies tab. 2. Create a New Policy or edit an existing policy. 3. Click on Windows Settings. 4. Click on the BitLocker tab located in the sidebar. 6. 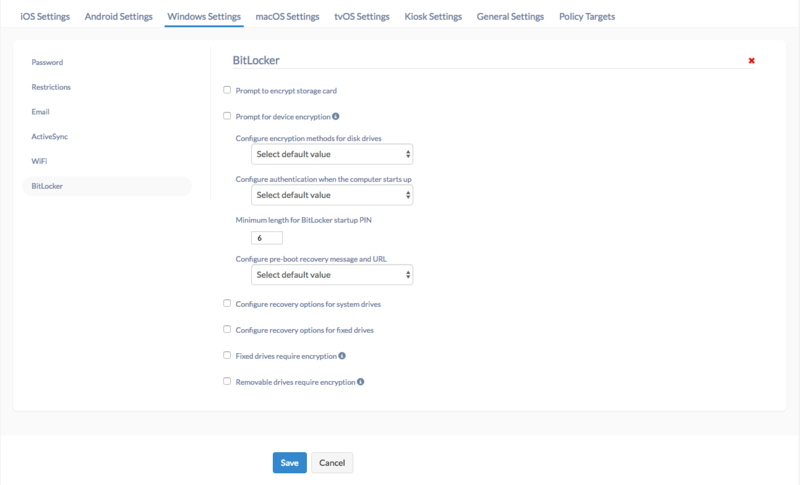 Set up the options required for BitLocker. Once the BitLocker is set, the data encryption would be initiated with devices that have been assigned to the policy. This topic was modified 8 months, 2 weeks ago by Frank Clinton.